I receive e-mails every day (99.9% of them positive) regarding the GRT triggers and I every so often I randomly add a few to this page. If you do not see your comments posted, please do not be offended as it would be impossible for me to add them all. I recently received and installed your GRT-4G trigger on my Gammo .177 Bone Collector. When I first purchased the rifle, right away  I was disappointed about how terrible the trigger pull was on an otherwise excellent rifle. I learned to shoot pretty well with it but found I was concentrating more on the trigger than keeping the sights lined up with the target. I had no trouble installing your upgrade and am amazed at what a difference it has made. The release is sure and smooth with just a gentle pull. I can't imagine how you could design and machine something like this; truly impressive! I would like to report that the trigger installations (all of them) went very smooth! 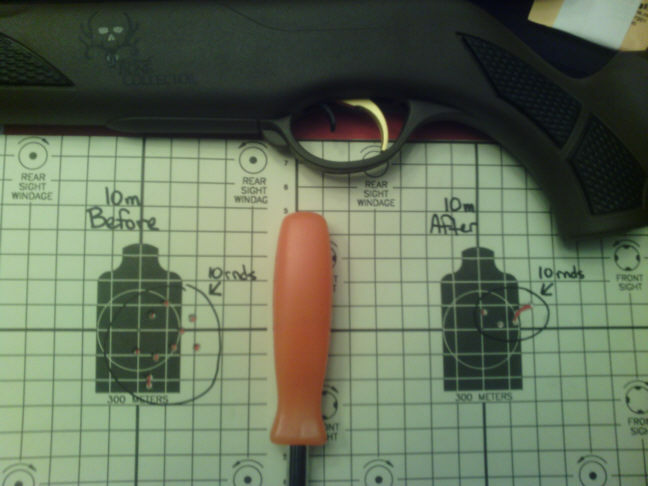 I and my son-in-law could not be happier with the difference the new triggers made in the performance of our rifles! One thing I would like to mention about spring piston or gas piston air rifles that I do not think is common knowledge is how different they are to shoot in terms of accuracy. I was a rifle instructor in the Marine Corps from 1961- 1964 and thought I knew all I needed about shooting rifles. Was I ever wrong!! I have since learned "The Art of shooting a spring piston air rifle" which is completely different than shooting a fire arm! Thank you for making these triggers available. You have several more extremely satisfied customers! I received the GRT4G trigger in the mail today, and I asked myself how I lived with the old plastic trigger. The upgrade only took about 10 minutes to install in my Gamo Hornet, and the results were immediately spectacular. After reassembling my rifle, I taped a piece of looseleaf paper to my trap and set it at 15 yards. My 20 shot group (yes, 20 shots. I couldnt get enough! ), was a little larger than a dime, a leap above my normal group. The trigger pull was light, crisp, short, and consistant. As a final test, I decided to shoot through the holes on the side of the looseleaf sheet. Three shots, three hits with no damage to the sheet! Thanks for your prompt service and OUTSTANDING product! What a product you have here! Your GRT-4G trigger has turned my .177 Gamo Hornet into a real tack driver. Instructions for instalation were spot on and only took about 20 minutes start to finish. I can't believe how crisp and clean it breaks. After guessing and pulling for what it seemed like an eternity with the factory set up, it is so much easier to concentrate on the target. Was shooting slightly larger than quarter size groups at 10 yards with factory set up and now at same distance less than a dime with 4 of 5 touching one another. Also your product has been machined meticulously and very nicely finished. Will definitely  recommend this product to everyone I know. Thanks for American Inovation at its best!! Thank you so much for the trigger... I attached a picture of my results for you to use as a testimonial if you would like. The installation process was quick and easy, and took less then 15 minutes.